An EC2 Fleet contains the configuration information to launch a fleet—or group—of instances. In a single API call, a fleet can launch multiple instance types across multiple Availability Zones, using the On-Demand Instance, Reserved Instance, and Spot Instance purchasing options together. Using EC2 Fleet, you can define separate On-Demand and Spot capacity targets, specify the instance types that work best for your applications, and specify how Amazon EC2 should distribute your fleet capacity within each purchasing option. The EC2 Fleet attempts to launch the number of instances that are required to meet the target capacity specified in your request. The fleet can also attempt to maintain its target Spot capacity if your Spot Instances are interrupted due to a change in Spot prices or available capacity. For more information, see How Spot Instances Work. You can specify an unlimited number of instance types per EC2 Fleet. Those instance types can be provisioned using both On-Demand and Spot purchasing options. You can also specify multiple Availability Zones, specify different maximum Spot prices for each instance, and choose additional Spot options for each fleet. 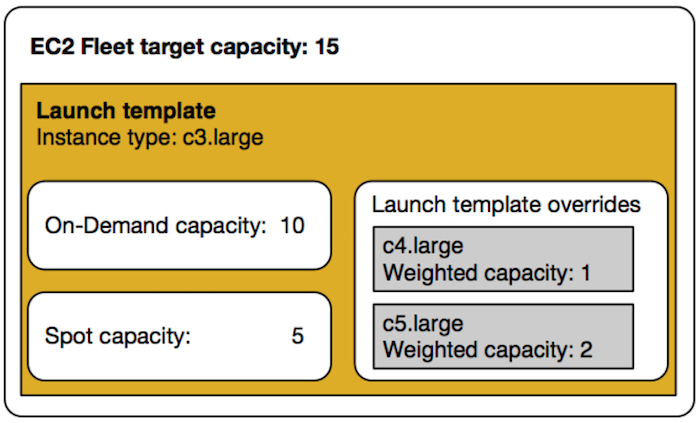 Amazon EC2 uses the specified options to provision capacity when the fleet launches. While the fleet is running, if Amazon EC2 reclaims a Spot Instance because of a price increase or instance failure, EC2 Fleet can try to replace the instances with any of the instance types that you specify. This makes it easier to regain capacity during a spike in Spot pricing. You can develop a flexible and elastic resourcing strategy for each fleet. For example, within specific fleets, your primary capacity can be On-Demand supplemented with less-expensive Spot capacity if available. If you have Reserved Instances and you specify On-Demand Instances in your fleet, EC2 Fleet uses your Reserved Instances. For example, if your fleet specifies an On-Demand Instance as c4.large, and you have Reserved Instances for c4.large, you receive the Reserved Instance pricing. There is no additional charge for using EC2 Fleet. You pay only for the EC2 instances that the fleet launches for you. EC2 Fleet is available only through the API or AWS CLI. An EC2 Fleet request can't span Regions. You need to create a separate EC2 Fleet for each Region. An EC2 Fleet request can't span different subnets from the same Availability Zone. If you need more than the default limits for target capacity, complete the AWS Support Center Create case form to request a limit increase. For Limit type, choose EC2 Fleet, choose a Region, and then choose Target Fleet Capacity per Fleet (in units) or Target Fleet Capacity per Region (in units), or both. * These limits apply to both your EC2 Fleets and your Spot Fleets. † These are hard limits. You cannot request a limit increase for these limits. If you plan to use your T3 Spot Instances immediately and for a short duration, with no idle time for accruing CPU credits, we recommend that you launch your T3 Spot Instances in standard mode to avoid paying higher costs. If you launch your T3 Spot Instances in unlimited mode and burst CPU immediately, you'll spend surplus credits for bursting. If you use the instance for a short duration, your instance doesn't have time to accrue CPU credits to pay down the surplus credits, and you are charged for the surplus credits when you terminate your instance. Unlimited mode for T3 Spot Instances is suitable only if the instance runs for long enough to accrue CPU credits for bursting. Otherwise, paying for surplus credits makes T3 Spot Instances more expensive than M5 or C5 instances. Launch credits are meant to provide a productive initial launch experience for T2 instances by providing sufficient compute resources to configure the instance. Repeated launches of T2 instances to access new launch credits is not permitted. If you require sustained CPU, you can earn credits (by idling over some period), use T2 Unlimited, or use an instance type with dedicated CPU (for example, c4.large).